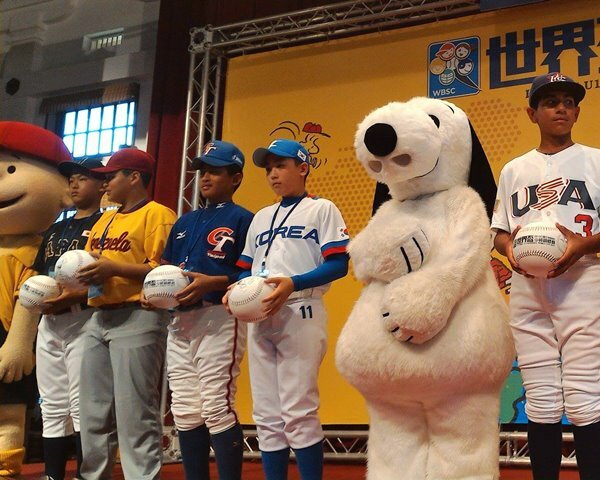 Snoopy is the official Global Ambassador of the WBSC U-12 Baseball World Cup 2015. TAINAN, Taiwan – The III WBSC U-12 Baseball World Cup 2015 is set to open with six international contests on Friday. The U-12 flagship world championship is the highest and most elite competition platform for 11- to 12-year-olds, who are selected as the best players in their countries to represent their respective U-12 National Teams. Being staged from 24 July to 2 August, the qualified nations are: world No. 1 Japan, defending world champions No. 2 United States No. 3 Cuba, Asian champions No. 4 Chinese Taipei, No. 8 South Korea, No. 10 Venezuela, No. 12 Mexico, No. 14 Australia, No. 15 Brazil, Americas champions No. 16 Nicaragua, No. 28 France, and European champions No. 32 Russia. The biennial U-12 Baseball World Cup platform is the only international baseball tournament in this age group to feature National Teams, which are exclusive to WBSC and its Members. It is the first time in history that the top four nations in the world -- Japan, USA, Cuba and Chinese Taipei -- will be featured together at the U-12 level. Taiwan’s top sports network, Videoland, will be producing all games at being staged at Tainan Stadium. Updates and real-time coverage will be made via twitter.com/wbsc, facebook.com/wbsc and instagram.com/wbsc.co. As an official world championship event, the results of the U-12 Baseball World Cup have an impact on baseball's official world rankings.